Chrysler's TC by Maserati was a "Q" body based on a modified second generation Chrysler K platform jointly developed by Chrysler and Maserati as a grand tourer and introduced at the 1986 Los Angeles Auto Show. After two years of development delays, the TC became available in late-1988 and a total of 7,300 units were manufactured in Milan, Italy through 1990. All cars sold as 1991 models were manufactured in 1990. The 1989 TC used a slightly detuned 160 bhp (119 kW; 162 PS)  Daytona-spec turbocharged 2.2 L straight-4. This intercooled version, known as the Turbo II, was coupled to an A413 three-speed automatic transaxle. The Turbo II was replaced by a Mitsubishi-sourced 3.0 L 141 bhp (105 kW; 143 PS)  V6 engine for the 1990 and 1991 model years, with the automatic transaxle being upgraded to a four-speed A604 unit. 500 cars were built with an optional drivetrain consisting of a Getrag manual transmission and a 16-valve head version of the 2.2 L. This engine is often called the "Maserati" engine because it was built by Maserati and has a Maserati-branded cast valve cover. The 200 hp (149 kW; 203 PS) 16-valve 2.2 L "Maserati" engine's cylinder head was cast in England by Cosworth and finished in Italy by Maserati. The pistons came from Mahle GmbH in Germany. The camshafts were designed by Florida-based Crane Cams and were manufactured by Maserati in Modena. The "Maserati" engine used a specially-made 2.2 block, upgraded crankshaft and rods. A Japanese turbocharger was sourced from IHI. The rest of the engine used common Turbo II parts made in the United States. The TC's platform was based on a shortened Dodge Daytona chassis with suspension and axles from the original model (except for the 5 speed Getrag with "Maserati" engine). The bodywork was produced by De Tomaso subsidiary Innocenti. The struts and shock absorbers were specially designed for the car by Fichtel and Sachs, and a Teves anti-lock braking system was standard. The special wheels were made in Italy by the Formula One supplier Fondmetal. The TC featured a detachable hard top with circular, beveled-glass opera windows with a six-point latching system and a manually operated cloth lined convertible top that was available in either tan or black. For the 1989 model year, interior leather colors were ginger or bordeaux. Available exterior colors were yellow, red, or cabernet. The bordeaux interior was only available with the cabernet exterior, both of which were dropped in 1990 when black and white exterior colors were added along with a black leather interior. The TC's dash, door panels, seats, armrest, and rear fascia panels were covered in hand-stitched Italian leather. Inside doorjambs were finished with stainless steel panels and sill plates. The convertible boot, over which the hardtop rests, is a body colored metal panel. A special interior storage compartment came with an umbrella, tool kit, and small spare tire that allowed the use of the full-sized trunk even with the top down. Standard equipment included a 10-speaker Infinity AM/FM cassette stereo, power windows, 6-way power seats, power door and trunk locks, map lights, puddle lamps, cruise control, and tilt steering wheel. The only extra cost option available for the TC was a CD player that was a plug-in attachment to the standard Infinity AM/FM cassette stereo. All drivetrain alternatives were no-cost options. The rarest TC built was a "special order" at the end of the production run for a Chrysler executive. It was white with a bordeaux interior and the Maserati 16V engine, the only 1991 car to have that color interior or engine. Total production and base price for each model year. The TC was sold by only 300 select Chrysler dealers. During the TC's three-year run, General Motors was offering as many as two luxury roadsters. The Cadillac Allante (1987-93), which was priced significantly higher than the TC, and the Buick Reatta (1990-91) which was priced similarly to the TC. The Allanté was also Italian-designed and partially hand-built. The Allanté was powered by a 200 hp (149 kW; 203 PS) 4.5 L V8 engine during the years the TC was sold (1989-91) with final assembly in the U.S., after the bodies built in Italy were shipped via special air cargo, while the Reatta was a 170 hp (127 kW; 172 PS) 3.8 L V6-powered roadster. The original idea of combining a Chrysler engine with a Maserati body was viewed by some automotive journalists as simply "taking the worst from each partner." The press was critical of the Chrysler TC, observing its similarity to the Chrysler LeBaron GTC convertible that cost much less. Lee Iacocca was a proponent of the new model "to change the way the world looked at Chrysler" and to create a new image for the automaker. Though the TC was expected to achieve annual sales between 5,000 and 10,000 units, it sold very poorly due its high price tag among other factors such as the lack of exterior color choices and undistinguished performance. In contrast, the LeBaron GTC had more color choices and exactly the same features at a considerably cheaper price. One expert about the Chrysler TCs claims that the automaker under Iacocca invested millions into Maserati, "but the Italian firm just did not deliver as promised" and the automobile marketplace had changed by the time the cars were delivered. Subsequent to TC production, Chrysler and Maserati eventually had common corporate ownership, following Fiat's takeover of Maserati in 1993, followed by its takeover of Chrysler in 2009. ^ "Nouveautés". L'Automobile Magazine (in French). Societé des Editions Techniques et Touristiques de France: 23. January 1986. ISSN 0758-6957. ^ a b "Chrysler's TC". maserati-alfieri.co.uk. Retrieved 2012-05-24. ^ Heitz, Rudolf, ed. (1987). Auto Katalog 1988 (in German). 31. Stuttgart: Vereinigte Motor-Verlage. p. 125. ^ "Chrysler Highlights". Automotive Engineering. Society of Automotive Engineers: 34. 1988. Retrieved 16 February 2018. ^ "Cars". Vanity Fair. 51: 108. 1988. Retrieved 16 February 2018. ^ a b c Hyde, Charles K. (2003). Riding the Roller Coaster: A History of the Chrysler Corporation. Wayne State University Press. p. 272. ISBN 978-0-8143-3091-3. ^ Ingrassia, Paul; White, Joseph B. (1995). Comeback:The Fall and Rise of the American Automobile Industry. Touchstone. p. 186. ISBN 978-0-684-80437-8. Retrieved 11 November 2013. Iacocca and De Tomaso agreed to mate a Maserati body with a Chrysler engine, which was taking the worst from each partner. ^ Johnson, Richard A. (2005). Six Men Who Built the Modern Auto Industry. MBI Publishing. p. 253. ISBN 978-0-7603-1958-1. ^ McCourt, Mark J. (August 2014). "1989-1991 Chrysler's TC by Maserati - Chrysler's classy answer to the Cadillac Allanté never found its niche". Hemmings Motor News. Retrieved 2 June 2015. 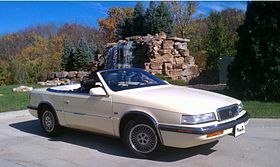 Wikimedia Commons has media related to Chrysler TC by Maserati. Lyons, Stephen. "Chrysler's TC by Maserati". Allpar.com. Auto editors of Consumer Guide (1 June 2007). "Chrysler's TC by Maserati". auto.howstuffworks. This page was last edited on 24 October 2018, at 08:54 (UTC).